It's Free and It's Easy so there is no reason not to participate. Truth is, this is just the begining, we are planing on having a giveaway 4 times each year. (One Per Season) We will give away some cool stuff every Spring, Summer, Fall and Winter. Can you imagine what we could possibly giveaway for Christmas? Well for future reference you can always drop you suggestion in our comments or inbox. If you have an awesome Idea that can suit our genereal Riverside public then you might be rewarded just for having the idea as well. We want to have fun and we want to it for Riverside. So this Spring,.. to get things started we are giving away three $50 gift cards. On July 1st we will randomly draw 3 names for our hat and each name will be award a $50 gift card. 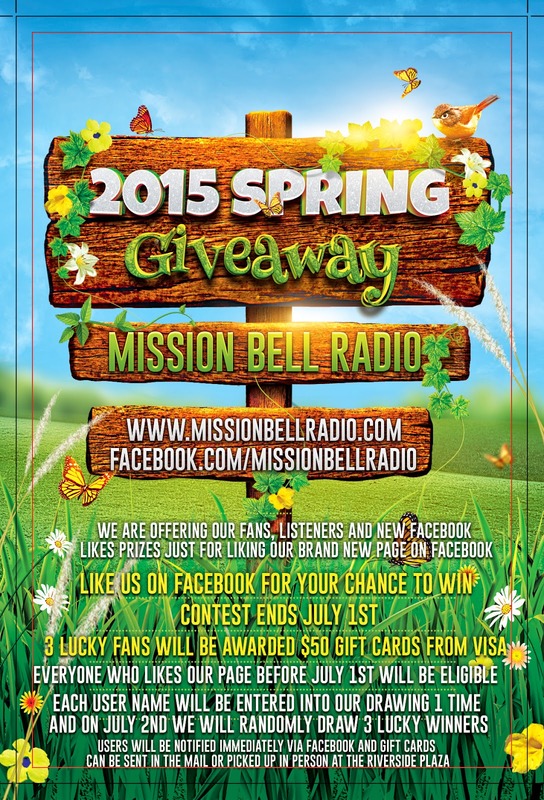 To be eligble all you have to do is like our brand new facebook page https://www.facebook.com/MissionBellRadio and you will be automatically entered in our 2015 spring giveaway and all future giveaways as well. All we want to do is let everyone know we are alive broadcasting 24 hours each day for Riverside and the Inland Empire. So if you have ideas to share our new station please send that message. Thanks to TUNEin we can all listen to Mission Bell Radio when we are on the go. The TUNEin mobil app is free and featuring our station plus 1000's of others.